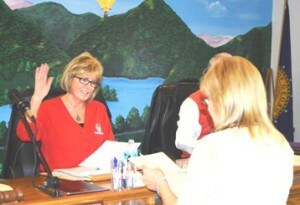 (HELEN) – For the second time, Dona K. Burke took the oath of office as Mayor of Helen Tuesday morning. That, in itself, is not unusual. What makes Burke’s second term as mayor of the White County city as she begins her 12th year on the city commission noteworthy is that her mother, Barbara Westmoreland, also served two terms as mayor there. Burke has been an outspoken member of the city commission when it’s called for, but she also works behind the scenes putting in numerous hours with city employees to make sure the city is decorated for various seasons. In Helen, a member of the city commission is elected by that body to serve a one-year term as mayor. There could be something historic about the second-term, second-generation female mayor. Burke is quick to clarify her motives and state she has no higher political aspirations.